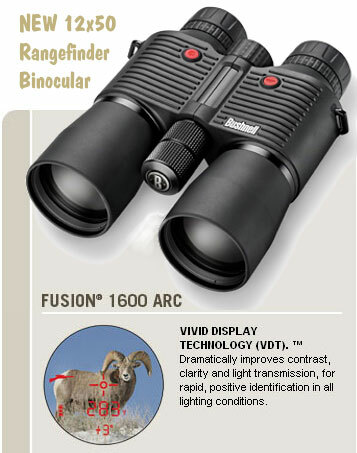 Last year we reported on the Bushnell Fusion 1600 ARC rangefinding binoculars. As first introduced, the Fusion 1600 was sold as a 10×42 binocular with ten-power magnification. Now Bushnell has introduced a larger, more powerful 12×50 Fusion ARC model. This has larger, 50mm objective lenses, plus 12X magnification. With a “street price” under $900.00, the new 12×50 Fusion 1600 is less than half the price of the less powerful 10×42 Leica Geovids ($2349.00) or Zeiss Victory RF Binoculars (10×45, $2,799.00). That huge price advantage makes the Fusion very tempting — but can Bushnell’s 1600 ARC binos perform as advertised? There is BIG difference between ranging a water tower, and ranging a deer-sized animal. Bushnell lists three different effective ranging distances for the Fusion 1600, and Bushnell claims only 500-yard effectiveness on deer-sized objects (vs. 1000 yards on trees). This is fairly consistent with our LRF comparison tests. You can see the features of Bushnell’s new 12×50 Fusion 1600 ARC rangefinding binoculars in the video below. This also shows the smaller 10×42 Bushnell Fusion for comparison. The video does a good job explaining the functional differences between the 12X and 10X units, helping you decide which one best fits your needs. Surprisingly, the bigger Fusion is only about one ounce heavier. If you have any interest in a combo bino/rangefinder you should watch this video. The reviewer concludes the Fusions represent good value for the money. The 12×50 roof prism binoculars feature built-in battery life indicator, twist-up eye pieces, and multi-coated optics with RainGuard. The Fusion 1600 is fully waterproof and submersible, meeting IPX7 “waterproof” specification. Owners have reported that the Fusion 1600 has good glass, and the red readouts are easy to see. Bushnell employs Vivid Display Technology™ (with four display brightness settings) to enhance display readability in all lighting conditions. The built-in laser rangefinder features ARC (Angle Range Compensating) technology, which calculates the angle to the target (-90 to +90 degrees). ARC also and gives the hold-over range for the rifle shooter, and true horizontal distance for bow hunters. We like the fact that you can choose between Inches and MOA for holdover. There is a brush mode for measuring distances in heavy cover and a bullseye mode for ranging in open areas. The brush mode can filter out false returns from closer objects. This IS a useful feature that actually does work. The Fusion 1600 ARC laser rangefinder binoculars come with battery, neck-strap, and carrying case. Typical retail price for th 12×50 Fusion is around $900.00. For more info, visit www.bushnell.com or call 800-423-3537 for consumer inquiries. Share the post "Bushnell Releases 12x50mm Range-Finding Binoculars"
Carl Zeiss Sports Optics announced that it is taking over distribution of the Hensoldt line of optics in the United States effective May 1, 2011. The Hensoldt line of riflescopes and other optical instruments for military, law enforcement and civilian applications is produced by the Carl Zeiss Optronics division and had been distributed in the U.S. by HDC, LLC (Hudisco.com) since 2008. Nathan Hunt, president of HDC, has joined the Carl Zeiss Optronics division in the U.S. as Vice President, Sights. In this role, Hunt will focus on the military market and help the Carl Zeiss Sports Optics team in Chester, VA, expand Hensoldt distribution in the USA. The customer base for Hensoldt optics is comprised of police and law enforcement agency sniper units as well as the most discerning competitive marksmen and shooting enthusiasts who are looking for the absolute finest optics available. Hensolt produce a a select variety of high-end optics, including telescopic sights, spotting scopes, and hterml imaging systems. Hensoldt scopes are very expensive but the optics performance and build quality is absolutely top-of-the-line. 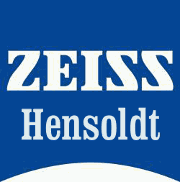 Share the post "Zeiss Will Now Distribute Hensoldt Optics in USA"